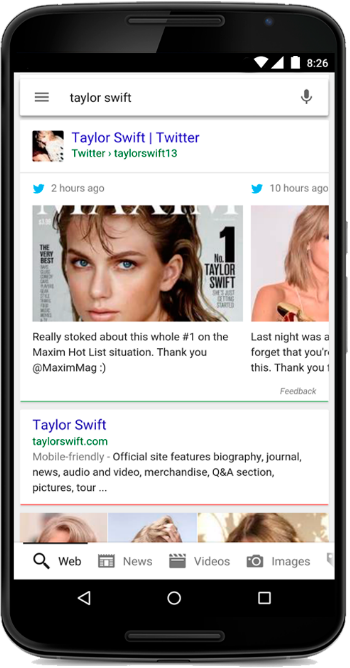 Thanks to the partnership between the two companies, today, mobile users in the United States may see tweets highlighted in search results. In the coming months, tweets will make their way to SERPs in other languages and on desktop. For example, if you’re interested in hearing more from Taylor Swift, a quick search on Google will pull up her most recent Tweets. Or, if you’re a TV buff, a search for #MadMen will bring up the most relevant news and Tweets about Sunday’s series finale. But a lot of information is noticeably absent from the two official announcements. How often will Twitter results be included in the SERPs? When included, how often will they be in a prominent position? And, most importantly, how will Google determine which tweets to display? Not having detailed answers to those questions makes it difficult for marketers to assess just how significant the deep integration between Google and Twitter will be. But the integration does raise an interesting and potentially very important possibility: search and social are finally coming together in a big way. The implications of that could be significant and far-ranging. For instance, brand marketers may find that the content they’re distributing on Twitter could soon have a much broader audience, reaching consumers who are searching for their brands on Google. That could be be good news for content marketers that have a well-oiled Twitter operation. On the other hand, marketers may also find that reputation management on Twitter becomes even more important as what people are saying about their brands on Twitter could make it into the SERPs. That could be bad news, as crisis management on Twitter can be very challenging and firestorms, often sparked by small but vocal minorities of users, are hard to predict. Obviously, marketers shouldn’t rush to jump to any conclusions. Before taking action to capitalize on this new relationship, or panicking over the potential headaches it could cause, they should closely monitor how the Google-Twitter relationship affects their Twitter presence and important search results related to relevant brand terms in the days, weeks and months ahead.